Are you overlooking the impact of global pork market on your financial bottom-line? 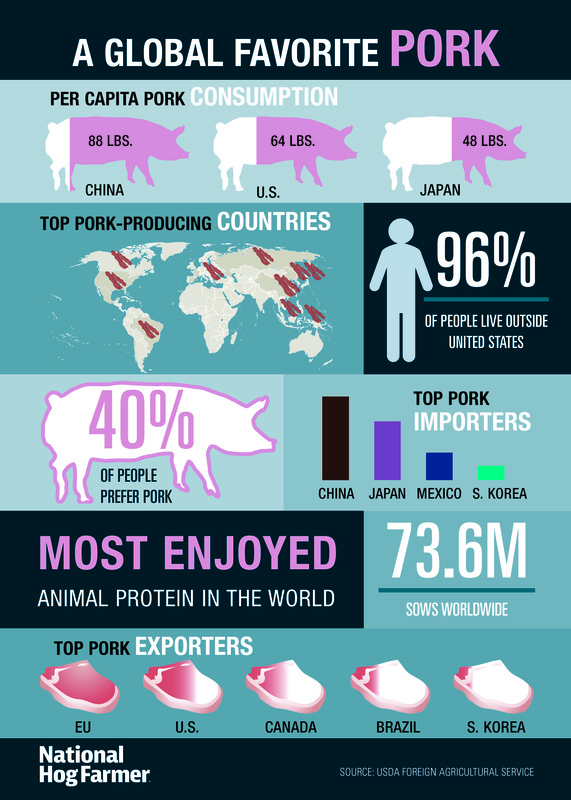 Pork makes the world go around as more and more people select this popular animal protein to fuel them. Looking at total world meat and poultry consumption, pork captures more than 40% of market share. Today, the demand data support people are sinking their teeth into meat and poultry more often these days as retail prices remain at an affordable rate. It takes many pig farmers — small, medium and mega-producers — to keep pork on the plates of consumers around the globe. The name of the game is to sell more pork. With 95% of the people in the world living outside of the United States, it is reasonable for the pork industry to set its sights globally. Standing in the middle of your barn, you may not see yourself as a pork supplier for the world. You passionately care for the pigs, doing your part to produce healthy, safe pork. In reality, with 26% of total pork produced in the United States shipped internationally chances are you are contributing more than you think. For those pork producers who sell pork products 100% directly to end-users domestically, you may be thinking the global pork market doesn’t apply to me. Perhaps, you are right, or perhaps you are overlooking the economic impact the global market has on hog prices. Currently, more pork is being produced while prices remain strong. Last year, the export value returned an average $53.47 per head back to producers. The strength of the U.S. pork industry lies in its diversity. The pork needs of consumers around the planet are honestly a mixed bag of personal preferences and cultural differences. It will take all pig farmers in the United States to fuel the world with wholesome, delicious pork wrapped in the desirable package. So, regardless of the size of your operation, you are important to the global pork trade. You know that if consumers taste U.S. pork, they will be hooked for life. Yet, getting more U.S. pork on the plates of consumers is complicated. U.S. pork is the most affordable on the planet, but the European Union sells more pork worldwide. Think about it. EU sells more pork. We are more efficient. We have affordable, safe and delicious pork but why are we not the leading exporter of pork. The devil is in the details. How do we get market access? How do we compete against other pork-producing countries and the competitive animal proteins? “The global market for pork is somewhat of a tangled web of import protocols, regulations, culture and economics, unfortunately, often in that order,” explains Brett Stuart, Global AgriTrends president. This is the exact reason why National Hog Farmer began the Global Mega Producer program to help untangle the web. This Wednesday, we will release the 2018 Global Mega Producer list and later in the week Stuart’s complete global pork commentary, outlining just where the U.S. pork industry fits in the global pork puzzle. The National Hog Farmer team looks forward to seeing everyone at World Pork Expo this week in Des Moines, Iowa.